OVERLAND PARK — Behavioral Health Holdings (BHH), a leader in serving children with autism spectrum disorder, is joining forces with the University of Kansas Edwards Campus (KUEC) for an innovative practicum program enabling online master’s degree and certificate students to meet field requirements for certification in applied behavior analysis (ABA), a recognized treatment for autism. The public-private collaboration offers a streamlined option for KU’s applied behavioral science students to complete 1,500 hours of field experience required by the Behavior Analyst Certification Board (BACB). In what could become a national model, the practicum will train students across four different care-delivery settings – early childhood development, an elementary and secondary education facility, residential support, and crisis intervention and prevention programs – rotating among Behavioral Health Holdings sites in the Kansas City area. BHH employees will serve as individual supervisors, while KU faculty will provide leadership and group supervision. “Autism is growing, and we urgently need more skilled professionals to provide consistent, personal interaction for these children. A child with autism typically needs 20 to 40 hours a week of hands-on, professional attention. How each child is doing today, and where they are heading in the future, directly depends on the behavioral services they receive, so it is critical to address the shortage of BACB-certified analysts,” said Marc Goff, chief executive officer of Behavioral Health Holdings. The Centers for Disease Control and Prevention recently reported that one in 59 children in the United States has a diagnosis of autism spectrum disorder, and autism is the fastest-growing developmental disorder. Even with about 18,000 board-certified behavior analysts in the United States, the growing problem and the intensity of services required has created an urgent need for more practitioners. 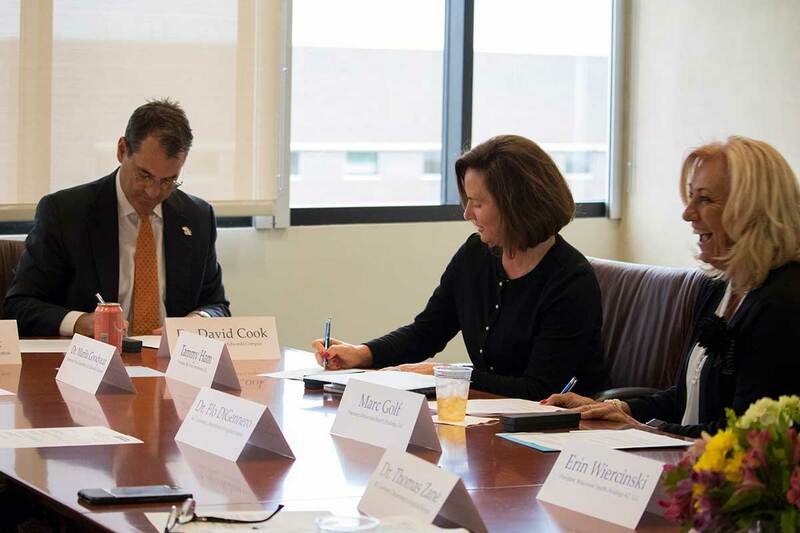 Photo: David Cook, vice chancellor of the KU Edwards Campus; Tammy Ham, president of BioNOVUS Innovations, and Marc Goff, chief executive officer of Behavioral Health Holdings, sign a proclamation solidifying a unique private-public collaboration that provides an innovative applied behavior analysis practicum program. Credit: KU Edwards Campus.